Plot Summary: The "dream railway paradise entertainment" story is set in a parallel world where Japan did not privatize its national railways. Naohito Takayama is an ordinary high school boy who dreams of a comfortable future working for the top-rated Japanese National Railways. He is assigned as a trainee in the Railways Security Force full of odd characters such as Sakurai, a troublemaker who hates men. On top of that, an extremist group called "RJ" plots to privatize the Japanese National Railways. Hopefully the remainder half is good enough to keep a momentum going. First episode was terrible and its stupidity was astounding. If bag snatchers hop on a train to escape, then why not put out an alert to staff at other train stations to be on the look out for the bozos when they arrive? There's absolutely no reason to have to hunt them down yourselves. I liked the first episode, although I thought some better work could have been done to convince us why these four would come together. Also when the spoiler[crooks got on the train] wouldn't it have been much smarter to spoiler[get a report sent to the officers at the next station, would have thought they would be trained in getting a photo of incidents, or at least there should be cameras up that would get a good look at them]. And how lax are their gun laws, I know they said there is training, but the implication was not the sheer paperwork that police officers have with just pulling it out. Also, just a month training for teenagers to be what essentially seems to be police officers. As stupid as it may be, it's still more believable than Library Wars, and people praise the hell out of that show for some reason and never dismiss its premise. Well at least the ED song is nice but yeah, my expectations aren't too high for this now. Hopefully, it improves. Despite the flaws that have been mentioned in this first episode... I still found it quite enjoyable to watch. This is a dumb show about dumb people doing dumb things. I kinda like it. The first half in the school was pretty dull but their crime fighting antics in the second half were kinda fun. I enjoyed the first episode. The thing is if they alert other officers then they wouldn't be able to beat the crap out of the thieves and join the special squad, and of course the show would have less action. This show seems to be more about main cast's heroism as opposed to following proper procedures. There were some interesting characters in that class. 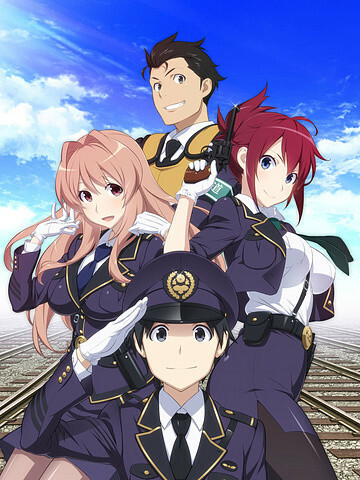 This is an awesome anime for train lovers who like fanservice. It's just not my kind of thing. I'll be skipping this one. When they are talking about trains the show is kind of neet but otherwise I don't have much to be invested in. Meh, first episode was enjoyable. I didn't expect this show to be a masterpiece, so I'm enjoying it. It's kinda dumb, but that's okay. I do expect to learn a bit more about trains and rail regulations though; that'd be really neat. I also liked the art and character designs. I wasn't a fan of the enormous flailing breasts and the fanservice though. I think I'll keep on watching at least for a bit more to see how it develops. Thoroughly entertaining, stupid fun. It gets bonus points for pleasant art and hot chicks. I accidentally paused it during the end credits when the girls were back-to-back and man, I totally didn't give Sakurai enough credit. I don't know jack about trains. Actually my first time seeing a cargo train was about a week ago. I moved provinces a month ago and while they had cargo trains in my old home they didn't run anywhere near where everyday life happened. As for passenger trains, my first time on one was when I was in Tokyo and I was like "meh, it's a train". So their educational blurbs and info dumps don't add anything to me. It kind of reminded me of that old You're Under Arrest OVA series. Actually, I always wanted to see a contemporary straight-up show set in a normal police academy. Maybe I'll get a similar feel from train security LOL. Ha, I am going through that show right now... (on around episode 20 and I really dig it). I hope this show runs along the same lines, I kinda enjoy seeing a police type show with wacky characters. Hopefully Rail Wars will be like it but on a train.